Don (Spokane, United States) on 1 June 2010 in Architecture. The Parish House sits on a hill and seems on top of the world on this foggy day. After being burnt down, it was rebuilt in 1887. It is a two-story building, the upstairs used for sleeping quarters, and the downstairs for daily activities. It contains a smaller chapel, mostly used for daily mass. Old Mission State Park is a state park and National Historic Landmark in northern Idaho. It is also known as Cataldo Mission. It contains the church itself, the parish house, and the surrounding property. Cataldo Mission is the oldest standing building in Idaho. You get the best misty shots. Super. Dans le mille, j'adore l'ambiance de cette photo géniale !! Peace ! Looks lonely in the fog. Beautiful, sweet image . 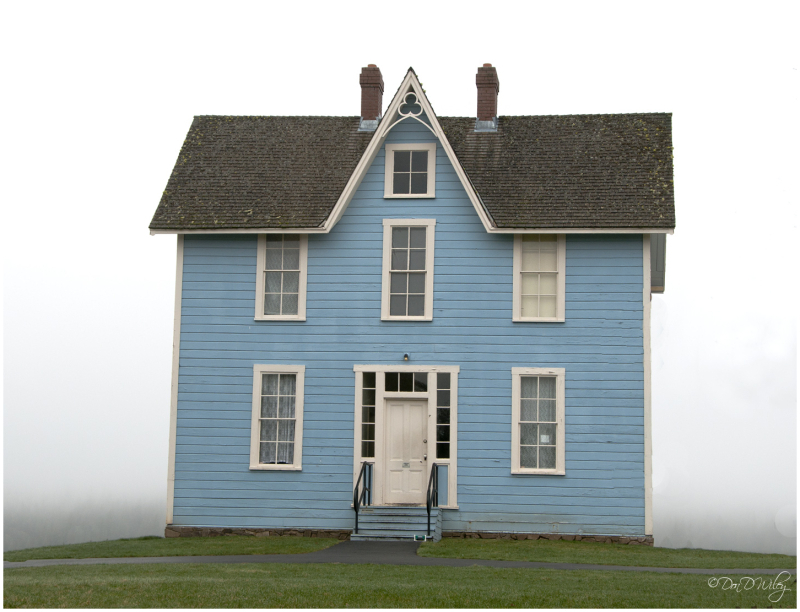 Love this little blue house . It looks like made of paper for girls' play ! What a piece of history. It's so pretty sitting there shrouded in the mist. A simple but straight-forward photo of a simple but servicable building. I do like the hints of background foliage visible through the fog. The color contrasts here are very nice. I like the simplicity of this image. Wow is that fog thick!!! Nice catch. Wow, wonderful shot with the fog/mist background, Don. The house really pops! As if it comes straight from a fairytale! Beautiful colors and A very special mood! On dirait un décor de théâtre ... Beaucoup de charme. It looks like a northeast colonial home in the midst of Civil War gun fire - that's what I thought when the page loaded. Doesn't look like a house I'd associate w/ Idaho. LoL! cool capture of this house in the fog. it really kind of throws me off balance with all the white surrounding the house. Cool shot.....from out of the fog.....Awesome !!! Love this shot! Nicely done. wow this looks like a doll house. so proportionate and charming. The fog really adds a surreal quality. Same thoughts as Dana, like a dollhouse. There is nothing for scale. So cute how it sits there surrounded by fog. I am attempting not to comment on every single picture, but cannot pass this one by...it is absolutely wonderful. Love this, what a great opportunity with the foggy background. It looks like the world just drops off behind it. Have you shown other photos of this? Is there a river behind it? It reminds me of the house in "The Shipping News" (book and movie).